*Please leave a voicemail if calling, or send a text. 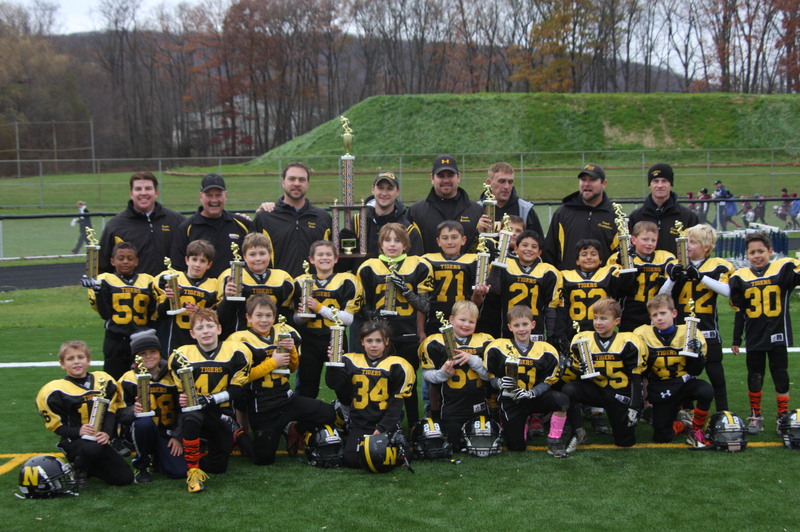 NYAA Youth Football is part of the Colonial Youth Football League (CYFL). Purchase Northwestern Tigers Football Spirit Wear online. Fundraising and volunteering is mandatory for all families throughout the season. The Rookie Flags division is considered an instructional program, and will be played 5 vs 5 or 6 vs 6. Similar to NFL Play 60 style rules. - Players will be provided protective soft helmet, “flags” and a uniform. - Parents must provide football cleats for each player and mouth pieces. - Practice for this age group will start July 31st, at 6pm and will continue throughout the month of August every Tuesday and Thursday. Once school begins, practice will continue Tuesdays and Thursdays. - Games will last roughly 1 hour. Age - 5 year olds. The cut off for all kids is September 1st. The Flags division is considered an instructional program, but is now competitive as of 2018. - Parents are responsible for providing cleats, and mouth piece for each player. - Practice for this age group will start July 31st, at 6pm and will continue throughout the month of August every Monday, Tuesday and Thursday. Once school begins, practice will be Tuesdays and Thursdays. Age - 6 and 7 year olds. The cut off for all kids is September 1st. The 100 lbs. division is a full contact tackle team that wears full protective equipment. - Players will be provided helmets, shoulder pads, practice pants, game pants, practice jerseys and game jerseys. - Parents are responsible for providing cleats, chin strap for the helmet and mouth piece for each player. - Practice for this age group will start July 31st, at 6pm and will continue throughout the month of August every Monday, Tuesday, Wednesday and Thursday. Once school starts, practice will be Mondays, Tuesdays and Thursdays. - Games will last roughly 1 1/2 hours. Age/Weight - 8 and 9 year olds: under 100lbs to run the ball and a 130lbs cap. The cut off for all kids is September 1st. The 120 lbs. division is a full contact tackle team that wears full protective equipment. - Parents are responsible for providing cleats, chin straps for the helmet and a mouth piece for each player. Age/Weight - 10, 11 and 12 (6th grade) year olds - under 120lbs to run the ball and a 150lbs cap. 12 year old in 7th grade is *100 lbs max (this is a change from 2018). The cut off for all kids is September 1st. There is no secondary cut off date for 7th graders. ** There must be some sort of documentation provided to the league that shows the grade of the 12 year olds. If nothing is provided to the league then the child will be designated as a 7th grader and has to weigh 105 to play** We will be asking for a copy of the final report card from the 2017-2018 school year. To help ensure the health and safety of young athletes, CDC developed the Heads Up: Concussion in Youth Sports initiative to offer information about concussions to coaches, parents, and athletes involved in youth sports. All coaches MUST take a mandatory concussion in service to obtain a certification. NYAA Youth Football is proud to have Lehigh Valley Health Network as it's official medical provider. LVHN will have an athletic trainer present at all of our homes games. Please visit www.lvhn.org for more information.